Lacey's painting "Eartha Delights IV" is included in this traveling exhibition. The Art Renewal Center, a 501C3 non-profit educational foundation dedicated to the renewal of traditional training techniques in the visual arts is pleased to present the winners and finalists of the 2014/2015 International ARC Salon Competition. There was an approximate 2,500 entries this year by over 1,050 artists. The works of contemporary realism featured in this upcoming exhibit just returned from a show hosted at the European Museum of Modern Art (MEAM) in Barcelona, Spain. While there, the ARC Salon winners were shown alongside winners from the 2015 Figurativas competition, a prestigious European representational art competition. The combining of these two shows was a historic event for the representational art movement of Post Contemporary Art, and constituted one of the largest collaborative shows on contemporary realism in the Western world. 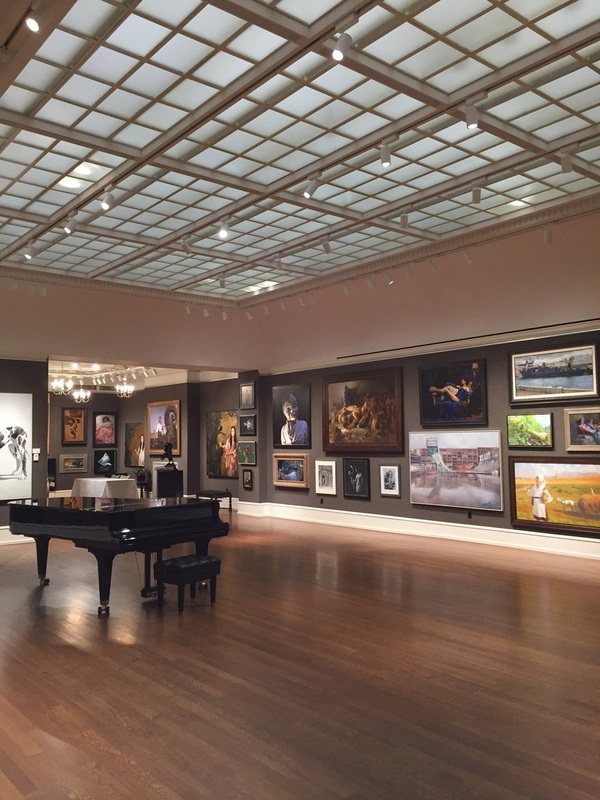 The ARC portionwill hang at the Salmagundi Club from January 18th to February 4th, 2016. ARC will be planning several lectures and educational events during the time the show will be in New York including a collaboration with the Da Vinci Initiative, whose mission is to bring skill-based techniques like those embodied by the works in the ARC Salon into K-12 classrooms. Tickets for all events are available for sale/RSVP through the ARC website. All proceeds will help fund the ARC and help to pay for the costs involved with running the show. The Salmagundi Club is located on 47 Fifth Avenue, New York, NY 10003. DVI Presents Atelier Training as a College AlternativeA special forum for high-school students and teachers on the atelier training method and benefits for those interested in pursuing a professional career in the arts. $15 General Admission only, the presentation is free. DVI President Amanda Hallenius will do a painting demonstration using skill-based techniques. $40 Fees are reduced to $25 for students and certified art teachers. For more info on specific events and to purchase tickets, please click on the event titles above. "Eartha Delights IV" Oil on Linen Adhered to Panel 36" x 48"
Lacey's painting "Eartha Delights IV" will travel to Barcelona, Spain later this year as part of a traveling exhibition. This honor came about as the painting was selected as a Rehs Gallery Finalist in the Art Renewal Center's 2014/2015 Annual International Salon. For the first time many of the works from the ARC Salon will be exhibited in a live traveling exhibition that will start at the MEAM Museum in Barcelona, Spain, where it will be on view from November 17th till December 28th to celebrate an intense collaboration between Europe and America for representational art. The ARC Salon's works will be mounted at the same time the MEAM mounts its 8th Figurativas Painting and Sculpture Competition. The MEAM competition is organized by the Foundation of the Art and the Artists, which is, along with the ARC Salon, the other most important competition for representational art in the Western world in which more than 2,300 artists from more than 90 countries participate. The 8th Figurativas Painting and Sculpture Competition, Figurativas 2015, will run between November 17th and January 10th. The Official Awards Ceremony of ARC Salon and Figurativas 2015 winners will take place as one tremendous event on November 20th, 2015 at 19:00 hours at the European Museum of Modern Art (MEAM) in Barcelona and a Forum of American and European representational artists will take place the following day on Saturday the 21st. Works for this exhibit are still being selected, though the MEAM Purchase Award and the ARC Purchase Awards shown below will all be included. The ARC Salon portion of the show will then travel to New York City, where it will hang at the Salmagundi Club from January 18th to February 4th. Lacey's painting, "The Strawberry Sirent," took 2nd Place at Overland Park's Art at the Center Annual Juried Exhibition. An exhibition featuring the work of artistic couple Jimmie Arroyo of Tenafly, NJ and local painter Lacey Lewis. Both artist’s figurative works convey a sense of sexuality and dark drama, but each with a distinct style.